Altus Sterling Silver headjoint ~ Preowned Price ~ $950 Sterling Silver Silver riser Classic cut Seamed Tubing One owner Pictues coming soon! ..
Arista Sterling Silver headjoint ~ Preowned Price ~ $950 Sterling Silver One owner Click on images for pictures! ..
Brannen Sterling Silver Headjoint #04039 ~ 14k gold riser $1,275 Sterling silver tubing .016" tubing 14k gold riser Made in 2004 Modern Cooper Cut One owner Excellent condition Click on images above for pictures! 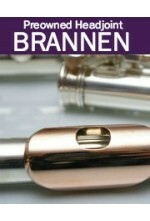 ..
Brannen Sterling Silver Headjoint #126 Listing Price $1,195 Another stunning example of Brannen's craftsmanship! This headjoint is Sterling Silver and has a clear, gorgeous sound. Sterling silver Early Headjoint made by Bickford Brannen One owner Mint co..
Emanuel Sterling Silver headjoint ~ Preowned Price: $1,295.00 This beautiful Emanuel headjoint is in excellent condition and features a warm, rich sound. 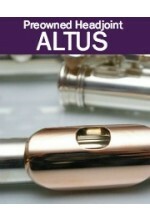 This headjoint has been played in the Boston Symphony! ..
Burkart Sterling Silver Headjoint ~ Preowned #802 A beautiful example of Lillian Burkart's craftsmanship. This headjoint is Sterling Silver headjoint has a full, open sound. A great headjoint at a fantastic price! Sterling silver Excellent condition .016 tubi..
Burkart Gold on Silver Headjoint #3416 Listing Price: $1,500 9k Gold on Sterling Silver tubing 9k Gold Lip Plate, Sterling Silver Riser M2 Cut Silver Crown One owner .016" tubing Photos coming soon! ..
Burkart White Gold Headjoint with 14k Gold Lip #2215 Listing Price: $4,850 White Gold tubing 14k Gold Lip Plate Silver Crown One owner .012" tubing Click on images above for pictures! 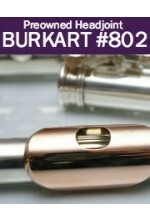 ..
Burkart Silver Headjoint with 14K Riser #2990 Listing Price: $1,695 Sterling silver tubing 14k Gold Riser M2 Cut One owner .016" tubing Click on images above for pictures! ..
Preowned Drelinger Grenadilla Headjoint Listing Price ~ $1,200 A beautiful preowned Drelinger headjoint. This custom handmade grenadilla wood headjoint produces a fluid, rich sound! Grenadilla tubing Sterling Silver Tenon Click on images above for pictures! 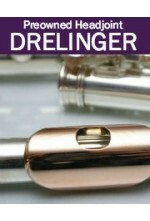 &..
Preowned Drelinger Headjoint #90A Listing Price ~ $1,095 A beautiful preowned Drelinger headjoint. This custom handmade sterling silver headjoint produces a fluid, rich sound! Sterlng silver tubing Silver lip plate and riser Click on images above for pictures! &nb..
Preowned Drelinger Headjoint #91J Listing Price ~ $995 A beautiful preowned Drelinger headjoint. This custom handmade sterling silver headjoint produces a fluid, rich sound! Sterlng silver tubing 14k Gold lip plate and riser Click on images above for pictures! &nb..